South Korea needs close consultations with the international community to consider the resumption of two inter-Korean economic cooperation projects as called for by North Korea's leader, the unification ministry said Wednesday. In his New Year speech on Tuesday, North Korean leader Kim Jong-un said he is willing to reopen the now-shuttered industrial park in the North's border town of Kaesong and resume the suspended tourism program to Mount Kumgang on its east coast without any preconditions. "As agreed before, it is necessary at this moment for us to focus on creating (the right) conditions," ministry spokesman Baik Tae-hyun told a regular press briefing. "Also, it is a matter that should be pursued in consultations not just between the South and the North but also with the international community and possible stakeholders in our countries." The industrial park and the tour program were two symbolic cross-border projects before they came to a halt in 2016 and 2008, respectively, amid worsening relations between the two Koreas. Kim and South Korean President Moon Jae-in agreed in their September summit to "normalize" them as soon as "conditions are met." The agreement, however, has not yet been carried out due to the multiple sanctions on Pyongyang that ban investment in and economic projects with the reclusive country. On Tuesday night, Unification Minister Cho Myoung-gyon told a local broadcasting program that it is hard to push for the resumption of the two suspended projects without considering sanctions. He reaffirmed Seoul's will to get them back on line first when inter-Korean relations further improve and North Korea gives up its nuclear weapons program. 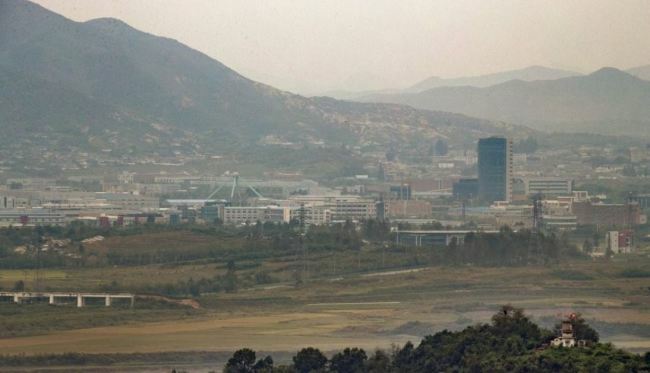 With regard to a possible visit to the Kaesong complex by businesspeople who once operated factories in the industrial park, the spokesman said that their trip would not violate sanctions but the government stance on it would be determined based on consultations among relevant ministries and agencies going forward. With inter-Korean relations warming since early last year, the two Koreas have pushed to bolster cooperation in diverse areas, but most major cross-border projects cannot proceed without sanctions exemptions from the United Nations. Seoul had to receive a sanctions waiver from the UN to carry out a planned joint inspection of railways in the North late last year as part of efforts to reconnect the rail systems of the two Koreas as agreed to by their leaders in April.